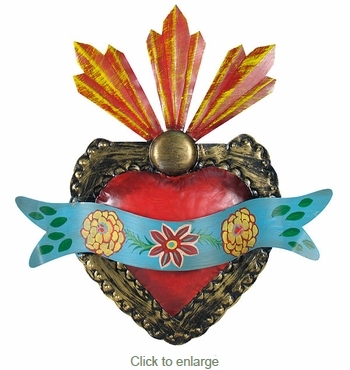 This hand painted tin milagro heart decoration is a beautiful addition to your southwest or Mexican hacienda inspired décor. These religious folk art crosses are handcrafted in Mexico. This Mexican painted heart decoration combines the artistic soul and spiritual heritage of Mexico's people. This beautiful hand painted heart can be displayed in a traditional home altar, or given as a special gift.